Grantsville’s Hillary Cloward (10), Hannah Butler (16) and Maison White maintain a good sense of humor during Wednesday’s match against Maeser Prep at the Class 3A state volleyball tournament in Orem. The match, which was originally scheduled to start at 8:30 p.m., started more than an hour late and did not end until after 11 p.m. I have newfound respect for the state volleyball tournament — or, more accurately, the athletes who take part in it. 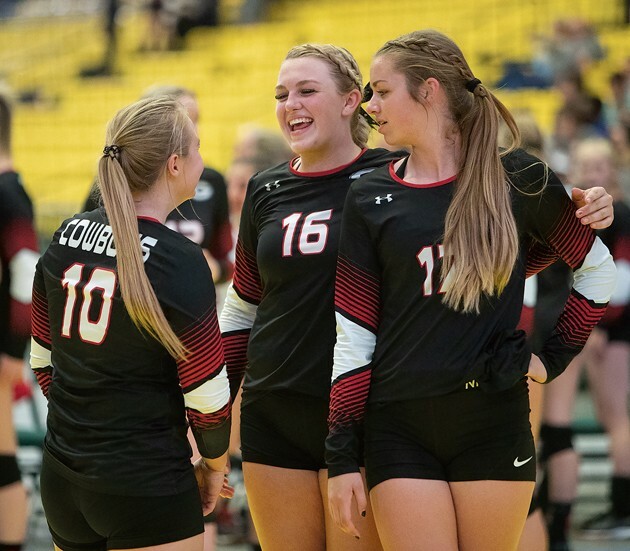 It was after 11 p.m. Wednesday evening when I spoke to Grantsville volleyball coach Kelbey Fisher on the floor of the UCCU Center in Orem, his team having just wrapped up a three-set victory over Maeser Prep to keep its season alive. They’d be back on the court again a mere 10 hours later to face Richfield in the consolation bracket, and they were less than five hours removed from opening the tournament with a match against Delta. That’s three matches in 15 hours — three grueling, high-pressure matches that took everything the Cowboys had to give, both mentally and physically. It was amazing to watch them battle their way through that late-night match, knowing their legs had to be like Jell-O from fatigue and their brains had long since been ready for bed. They deserve a lot of credit. The Utah High School Activities Association might want to rethink things, however. Last year, I was there when Tooele and Stansbury had to deal with the same situation. Matches that ran long earlier in the day pushed the scheduled start times back, meaning an already-late 8:30 p.m. match started closer to 10 p.m. And if they hadn’t reserved hotel rooms, they’d have had to drive back to Tooele County after losing out of the tournament, gotten home in the wee hours of the next day and possibly had to get up early to go to school a few hours later. Perhaps it’s time that the UHSAA takes this into account. It’s not good for anyone when you’re still playing volleyball at 11 p.m. on a Wednesday night. It’s not good for the players who got up early that morning and attended a full day of school before playing a pair of matches. It’s not good for the parents who had a full day of work, drove from Tooele County to Orem and were sitting in a mostly deserted UCCU Center long into the night. The crew responsible for cleaning up the arena was made up of Utah Valley University students who had class the next morning. There were UVU police officers running security well beyond the time they were supposed to be home. Maybe it’s time for the UHSAA to realize that running two double-elimination tournaments at the same venue on the same day isn’t a reasonable solution. If the double-elimination format is going to continue, multiple venues might be the answer, or it might be time to extend the tournament an additional day. Other states have been successful with different formats, and the UHSAA would do well to at least explore some of those options. I worked in New Mexico for nearly four years, and the New Mexico Activities Association had the volleyball tournament down to a science. All five classifications played over a four-day span. The first day or two was spent on pool play, where the 16 teams in each tournament played for seeding. Then, it was single-elimination from there. Somehow, no matches in tournament play were scheduled to begin after 7:15 p.m., despite the entire tournament being played in a minor-league hockey arena roughly the size of the UCCU Center. Such a format would be to the benefit of the athletes, the parents, the coaches, the officials and those hosting the event. Darren Vaughan is a veteran sports writer from Moab, Utah. He admires any athlete who can still perform at a high level well after his bedtime. Email him at dvaughan@tooeletranscript.com.